Let's be honest, who doesn't love curling up on the couch with a quilt? It just is usually a finished one. Someone is excited for their new quilt. Now making buddy's is a must! 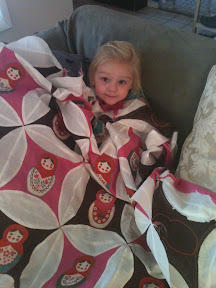 I'm so proud to have a daughter that is such an awesome quilter! I love it.